Police Horse 2, originally uploaded by veesvision. Occasionally we can hear the clop-clop of a horse going up our street. It always brings the kids to the window. 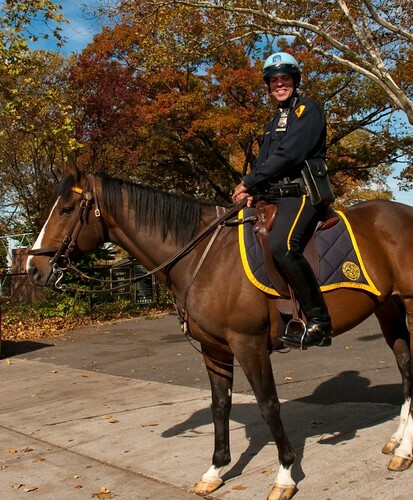 Yesterday, we got to meet this officer and his horse, as did veesvision, in person. Both were very friendly. I don't know about you all, but I think the change to foot patrols and those mini-carts in the park is hugely positive. The image of police driving through the park is pretty negative (a la Do the Right Thing), and it doesn't encourage interaction or safety for pedestrians. Besides, being the child-centric sort of resident that I am, those carts are a constant source of curiosity for my toddler. The horse was all he talked about for the rest of the day. Have you noticed that the horse is there at any particular time? We would love to be there to see it in person -- though my toddler is kind of scared of large animals. The little cop carts are a huge addition. The patrol cars were not only ugly and weird in that pastoral park, but flat out dangerous. I almost saw them hit kids several times.